there is a library for that called guice-repository. The only drawback of using this library is that it pulls almost the entire spring framework as a dependency since it uses it’s classes. Runnable as using in-memory db. 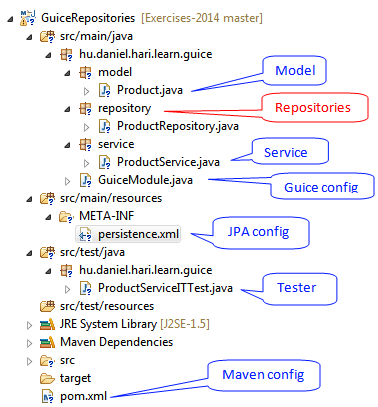 NOTE: You can not use guice-persist and guice-repository in the same project, this example is about how to use guice-repository. We will first look into our pom.xml file for all the required dependencies. We define a persistence unit as in-memory database and Hibernate JPA provider. Repository is the data access layer in this project instead of DAO Classes. It is an interface, so no any implementation needed, only method names and annotations. We inherit JpaRepository that has many CRUD and other JPA operations defined already, that we can use without defining them, but we can define more specific operations like below. We haven’t need to define findAll(), because that is inherited. We defined a query by fluent keywords method name : findByNameContainingIgnoreCase(). spring-data-jpa translates this to a query automatically. We defined a query by @Query annotation. * use it exactly the same way as Spring DATA-JPA. Note that repository is injected in service. Please note that @Transactional annotations used in service layer’s write operations. Let’s configure the guice module. Define a tester class for our module. We use an in-memory db for testing. Please note, that this is an integration test, since we don’t want to test classes each by each now, rather we want to test the module as it is. ProductRepository is needed to be accessible from test class only because we have to clear the entities before each test methods to provide independence. Parallel running of test methods is not possible for this test. We also test a rollback of a transactional service method call. You can download the final project from below link and play around with it to learn more. Dániel Hári is the founder of log4jtester.com, cleancodejava.com. Who	is an enthusiastic Java developer who enhances his knowledge by continously searching for best practices and modern technologies. Engaged to clean coding, and honors the engineering profession as releasing quality work.